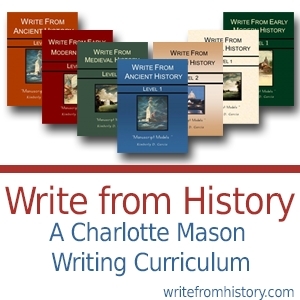 Making Homeschool History heaps of fun! Studying the middle ages has always been so much fun in our home because of the hands on history project ideas. 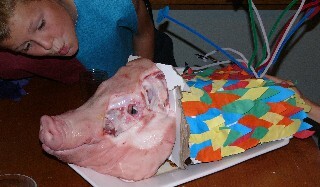 One fantastic highlight has been our medieval feast - which we have now done twice! Making costumes, deciding on a menu, decorating a pig!, planning the activities and speeches, painting, and making shields for all the guests! We still have the shields years later hanging in our boys' room. 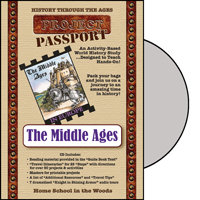 You will be staggered through the amount of interesting ideas this Project Passport - The Middle Ages Guide has to offer. It comes as a CD or as a download. All the printables to create games, scrapbooks, newspapers, postcards, feasts etc - are all included. Check out homeschoolinthewoods to see what they have to offer and how learning through discovery, history projects and activities drive lessons home in an exciting way! Included are 25 "Stops" that can spread across 8-12 weeks, where you will witness exciting events and meet interesting people of the Middle Ages. Topics include: Barbarian invasions, everyday Medieval life, the structure of the classes, towns & guilds, science & invention, education, the arts, church history, the castle, the Crusades, knights, vikings, battles & wars, and more! No better way to understand the idea of trade, resources within the setting of the middle ages. We have played this often with all ages and each game is unique. It incorporates much of the trading related ideas from medieval days and other sets can be added. Create an illuminated manuscript, try out life in the feudal system, experience the awesome transition from superstition to science, examine famous documents, design a castle, host a joust! These wonderful hands on history project ideas and activities for groups and individuals are included in this outstanding resource. Literally open up the castle to see what life was like inside those stone walls! This cut-away book features a 3-D plastic castle in the center; as you lift pages, more and more is revealed alongside fascinating explanatory notes. Find out about castle design, medieval tournaments, battle reparation in the armory, cooking in the kitchen, through this history project ideas book. 16 pages, hardcover. What a great idea! 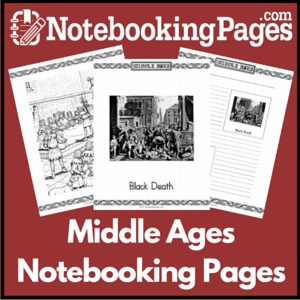 Another way to consolidate your understanding of the Middle Ages is to draw it! Great for the kids to do when you're reading one of the fantastic medieval living books! Draw and write your way through the history of the Vikings, Middle Ages and Renaissance, as you learn about castles, Robin Hood, Pagodas, longhouses, a musketeer and more. Drawings are shown with step by step illustrations, and copywork is written out in cursive. Great for supplementing any history program! Ages 8-12. 64 pages, softcover. One thing that we have done over the years is to create our own History Notebook. It's really easy to do. When you've read a great historical fiction book together, the children write a narration into a blank notebook. They can decorate it in any way they like - print off pictures, add in borders, titles as well as make their own history time-line at the top or bottom of the page. As you can see in the example below - we have added a time-line across the top of the page and cut this from the page - so that the time-line and the page are independent from eachother. The reason for this is that you may have a number of pages of pictures, stories, maps etc dealing with one character, war, event - and it is handy if the time-line at the top is not a static part of that page. 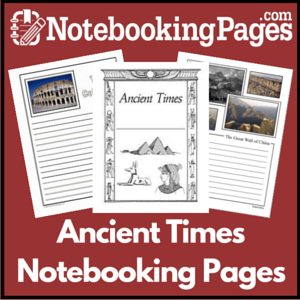 History Time-line added to the top of the history notebooking page. These pictures can be useful when creating a timeline - whether you make one on your wall or put it within your own history notebook. 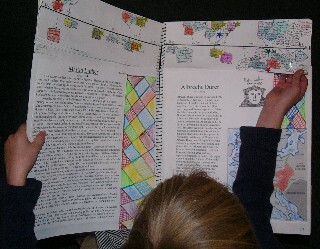 Using characters to copy, cut and colour helps to visualize the procession of time and how one event spurts on another. 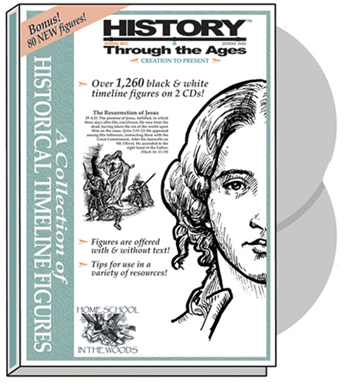 Using these timeline figures is a wonderful addition when studying any time period. This history project idea can be continued through all the ages and even added to a history notebook or to the wall. While studying the Middle Ages, I created an E-book of the Text of The Famous Men of the Middle Ages by John H. Haaren and A.B. Poland as well corresponding notebooking pages. 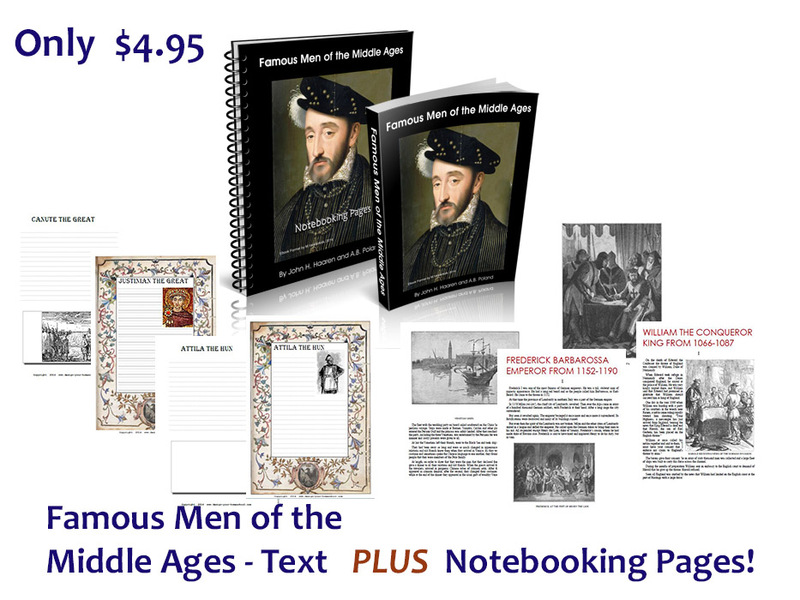 It is an easy way to notebook and create a memorable History Notebook around your study.